Wondering what to give trick-or-treaters that won't cause tooth decay or candy craziness? Why not some candy experiments? I print these cards every year to distribute with my Halloween candy so that kids can go try the experiments at home. I'm also offering these cards as perks for my campaign to raise funds for taking Candy Experiments to Washington DC. If you'd like to help me get thousands of schoolchildren hooked on science, or if you just don't want to print out that many cards yourself, find the details here. Here are the links for my free candy experiment card downloads. 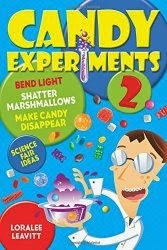 These experiment cards contain simple instructions for candy experiments. Download and print to pass out to trick-or-treaters or or use at candy experiment parties.